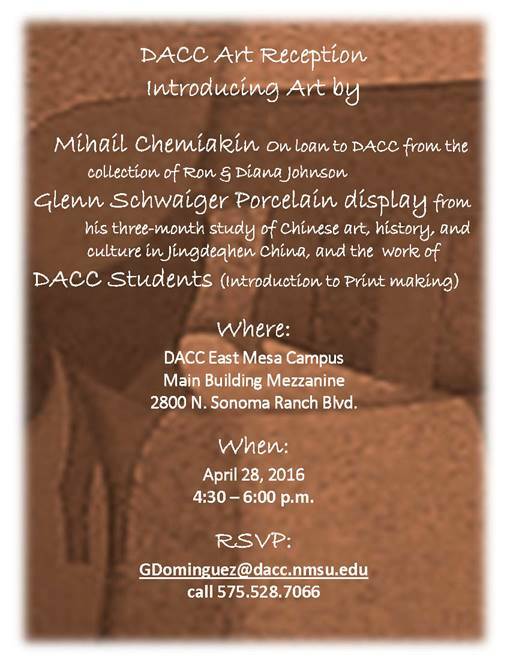 Please join me to celebrate art at Doña Ana Community College this Thursday, April 28th from 4:30-6:00 p.m. The artwork of Míhaíl Chemíakin, a Russian artist currently exiled in France, is on display in the Main Building Mezzanine at the DACC East Mesa Campus. Chemíakin’s unique colorful and playful prints are reminiscent of Cubist and Surrealist styles. In the Mezzanine, I have a display case highlighting traditional ceramics from China and several of the works I made during my sabbatical in Jingdezhen. The printmaking students of Ouida Touchon have a lovely display case also. Lecture, Thursday, June 23rd 6:00-7:30 p.m.